House on a raised ground of 2500 m2 on top of a hill. Original paintings of a renowned painter. Very large terrace (45 m2) .Transats. We travel frequently and often rent houses thru Home Away and VRBO. This is by far the best place we have ever rented. 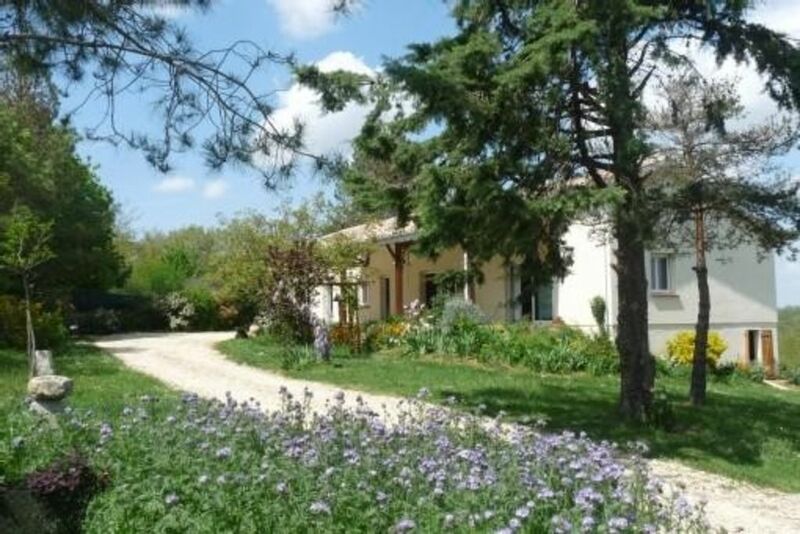 The property is beautifully situated, away from the main road, overlooking a field of sunflowers. There is a lovely, well kept garden, and a small orchid in the back. We were there at the end of August, when the peaches and figs were ripe, and the owner made it clear that we were welcome to pick the fruit. Fresh picked peaches and figs for breakfast! The house itself is large, comfortable and well decorated. The bedrooms are comfortable, the kitchen is fully equipped, the bathroom is modern with plenty of hot water, and the newly installed wifi is fast. The owner greeted us when we arrived, showed us around, and said the place was ours for the duration of our rental. We had complete privacy. In case of emergency, the the owner's family lives nearby, though we had no need to contact them. Downsides? Well, the place is a bit hard to find at first. Keep an eye out for the goat cheese sign on the highway. It is hard to believe that there is a more lovely and comfortable rental anywhere in Gascony. French hospitality at its best! Wonderful place! Quiet, comfortable, has everything one can possibly need, and of the highest quality. Equipped with such attention to details as one would do for their dear friends, not just regular visitors. We're extremely grateful to our hostess Helene, not only she is really responsive and helpful (found an electrician within 30min on the Easter Sunday(!) to fix a minor problem), but also totally non-intrusive and generous in her spirit, giving you all the possible space and time, and all those little things that make the huge difference when you travel. We travel extensively and have stayed in many places in different countries. This was the only time when we felt like we're home. Also we feel like we found not only a great hostess, but also a friend. Merci bien, Helene! Gîte très confortable, très calme, au milieu de la nature et des animaux de la forêt. Nous avons passé un excellent séjour dans ce gîte proche d'Auch et de ses festivités, tout en étant en pleine nature. vacanciers très agréables et conviviaux. Revenez quand vous voudrez ! La maison où nous avons séjourné est très agréable. Située dans un cadre verdoyant et au calme, elle a tout le confort moderne. C'est la maison d'une femme cultivée. Les livres, les instruments de musique et les peintures l'habitent parfaitement. La propriétaire est une femme charmante. Nous avons passé un excellent séjour dans la très belle maison de Madame Mimaud Lacoste, à la fois grande, spacieuse, tellement bien équipée et avec une vue superbe sur les collines Gersoises. La maison est entourée d'une grande terrasse et d'un immense terrain arboré. Nous avons pu profiter des fruits et légumes du potager. Nous reviendrons avec grand plaisir. Une maison géniale, spacieuse, propre, où il fait bon séjourner.Une vue magnifique sur les collines gersoises.Les alentours y'en a de trop à faire en 15 jours pas possible alors faut y revenir et que dire de Mme Mimmaud-Lacoste, Hélène pour tout le monde là-bas, eh bien une femme de goût et de goûts, discrète mais présente, qui sait faire connaître et aimer son Gers.Vraiment que du bon, du bien, du mieux, du meilleur.Un Département trop méconnu, mais peut-être est-ce mieux ainsi pour qu'il reste encore authentique. Les Gersois sont hospitaliers, aimables et toujours prêts à aider. On reviendra sans aucun doute dans le Gers et particulièrement chez Mme Mimmaud Lacoste. Encore merci pour tout et on se voit bientôt. Located in a floral park, shaded in summer and fenced. 7kms from auch, 90 ski slopes (Pyrenees and Spain) 7 km from supermarkets, golf 3 kms, casino and spa nearby. The small village of Ordan-Larroque, a small flower jewel 4 flowers: has an interesting archaeological museum. Forest nearby to take walks and pick porcini mushrooms in season. option ménage : 50 euros. (option facultative) si pas de location précédente, possibilité d'arriver le Vendredi après-midi.